The low, wet forests of Central America are home to to the only variegated species of cycad in the world, Zamia variegata. This species is often listed as “small” in size, but don’t be fooled, it can have fronds up to 3 meters long. Though there are a number of related cycad species, none possess its one unique feature – variegated leaves. 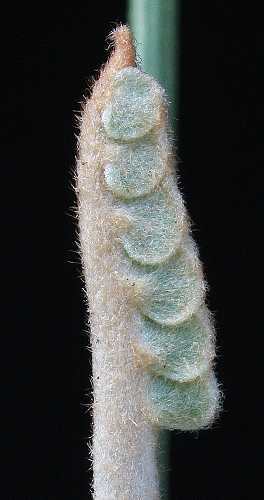 The newly forming frond of Zamia variegata is covered in a fine light green and brown pubescence. Z. variegata (also known as Zamia picta or Z. picta variegata) is an evergreen herb with a relatively small underground stem or caudex. This is basically round and usually not more than 20 cm across, boasting just a few leaves at any given time. The fronds are long and their structure is analogous to a once pinnate fern. The midrib or rachis, as well as the petiole is furnished with many short, yet sharp spines. The petiole may make up as much as 1/3 of the total frond length, which is typically 1.5 to 2.5 meters long, but may be up to 3 meters in exceptional specimens. The pinnae, or leaflets, are born in opposite pairs along the midrib and are quite long and broad, 15-35 cm long and 4-9 cm wide. When mature they are stiff and glossy, a rich green color, and striated with many streaks of irregular yellow-green lines, spots, and patches. Like many cycad plants, they are serrated. Initially the new fronds start out as tiny yellow/green growths originating from the crown of the caudex. Over a period of 5-8 weeks these gain in size and finally mature and harden off. 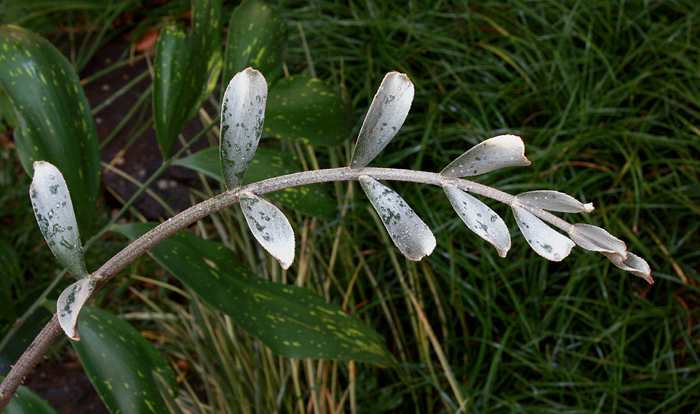 The young frond is covered in silvery to brownish pubescence, which is eventually shed from the mature frond. The speed at which this young growth expands and matures into a full grown frond is truly remarkable, as in other cycad species. 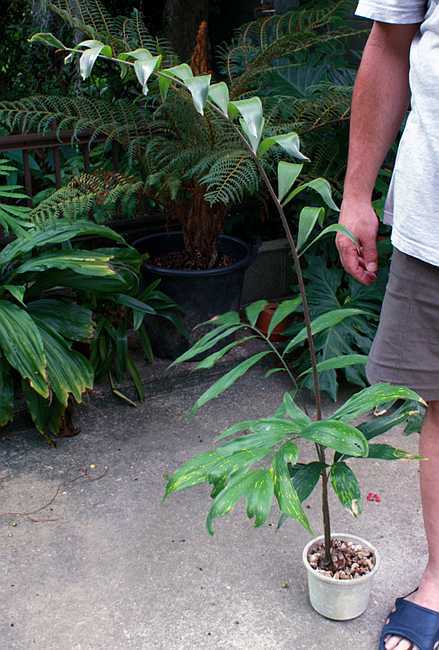 Mature fronds of Zamia variegata can be up to 3 meters long and hang in a graceful arc. These, like all cycads, are nonflowering plants that bear cones. They also are dioecious – having separate male and female plants. The female cones usually are born few in number while male plants can throw many cones all at one time. The latter are thinner and much smaller in size than the female cones. It is said that well grown plants can reach reproductive size in less than 10 years from seed – fast for a cycad. This new frond is three times the size of the previous ones, showing how young, vigorous specimens can increase rapidly into adults. 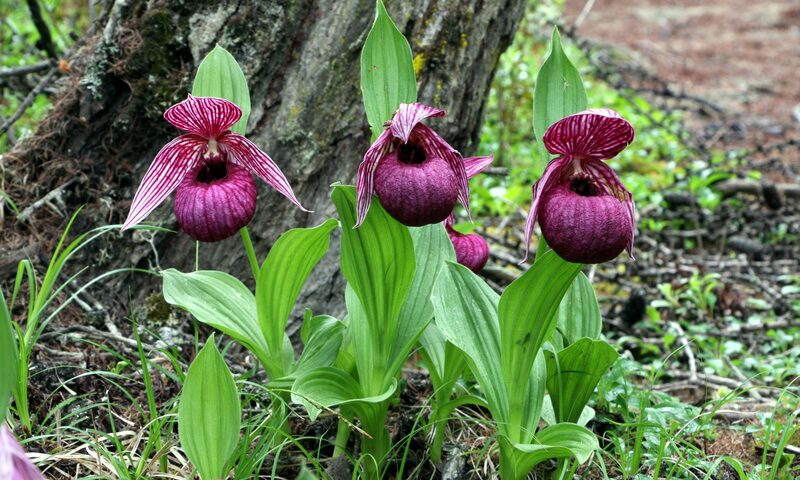 This species is restricted to low land wet forests and up to 500 meters elevation in pine-oak forest in southern Mexico (Chiapas), Guatemala, coastal Honduras, and Belize. Given its fairly broad range it may in fact represent more than one taxon, but that remains to be proven. My personal journey with this plant started a couple years ago when I bought two young, yet healthy plants. Upon getting them I immediately repotted them into new compost – a mix of coarse perlite, fir bark, and kanuma (a weathered pumice). They were given ample water in the summer months and generous handfuls of pelletized organic fertilizer. While both grew a couple nice modest sized fronds, they remained small plants the first year. This summer (2012) the larger plant decided to put on some weight – and fast. It grew a new frond that ultimately was nearly three times the size of any of its other fronds, showing how happy plants can bulk up fast. 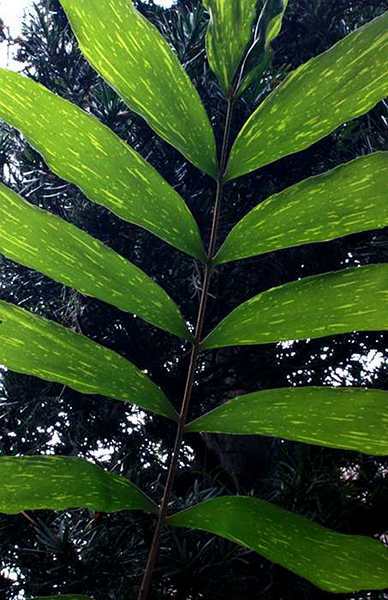 The new frond is nearly 2 meters in length, close to full, mature size. Since my cycads go into a near dormancy in the winter months, I don’t think it will throw any more fronds this season, but look out for next summer – it may get huge by then. The young frond is very soft and easily harmed, so it is necessary to protect it from insect and mechanical damage. Notice the silvery pubescence at this stage of development. The petiole is covered in sharp, short spines – be careful, they hurt! What can I say about this species other than it is a true novelty. While variegation is seen in a variety of cycad species, it is always the result of genetic mutation. How the variegation in this species became genetically stable is a mystery. Most specimens show at least some variegation, however some are nearly pure green – sometimes called the ‘concolor’ variety. 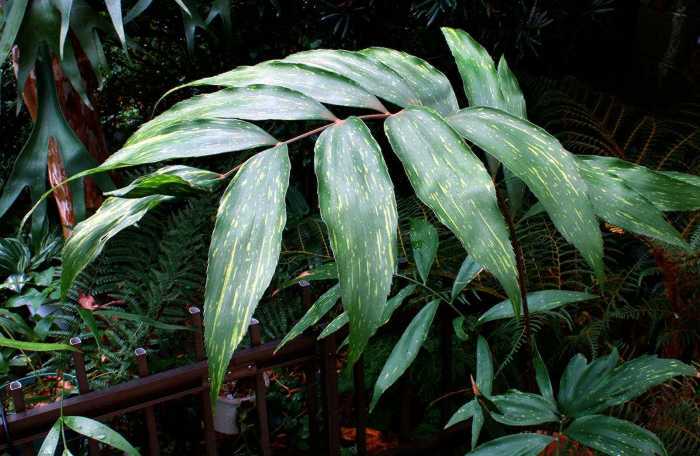 Regardless, it appears that the genes regulating this variegation are dominant since hybrids with other Zamia species are said to have variegation as well. The main drawback of this plant is its frost intolerance. While it can easily take winter temperatures down to even 5 C on occasion, it will not tolerate freezing temperatures for very long before running into trouble. Therefore it can only be considered for tropical to subtropical gardens, USDA cold hardiness zones 9b or higher. If you do get a hold of one, give it plenty of warmth, water, humidity, and a well draining, yet organically rich compost. This is a plant of wet, warm forests. Also, don’t be shy with the fertilizer when it is in growth. If you grow it in continuously warm conditions it will grow unabated. Also, no sun on this one as you will only succeed in burning its lovely fronds. They are adequately yellow blotched in the shade! When backlit the mature frond of Zamia variegata puts on a truly remarkable show. A true novelty among a plant group that is a novelty in and of itself, Zamia variegata stands alone in its uniqueness. Here’s one cycad you have to tip your garden shears to. Hi Noelle, It is possible you indeed have a cycad. If so it likely is the commonly available Cycas revoluta.